Of my 30+ year career in the travel industry, 13 years of my career were spent with the GDS companies. Since 1996, I have been doing strategic consulting to companies throughout the travel ecosystem value chain on the nuances of multi-channel distribution, both from a technology and a business model perspective. 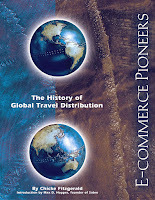 My first book, ECommerce Pioneers, the History of Global Travel Distribution was about the companies that laid the foundation for ECommerce before the Internet was a twinkle in Al Gore's eyes. This 200+ page tome was first published in 1999 and updated in 2002 as a part of three book series known as the Travel Distribution Library. I say all this simply to frame my background and ability to comment somewhat intelligently on this topic. And as I mentioned yesterday in my blog on Profitability, with the Department of Justice (DOJ) now involved in this battle, it is time to speak up on the various arguments in the airline/GDS debate. Today, the argument that I watch with rapt attention is the one between parent (AA) and the now "disowned child" (Sabre). Now, you can argue that disowned is too strong a world, since American made a tidy sum in selling off Sabre, but I contend that the word picture is nevertheless accurate. Sabre would not exist had it not been for its birth as "marketing automation" within the airline in the late 1970s. And their current legal battle in District Court in Ft. Worth, Texas shows that they are indeed estranged. The child is now nearly 32 years old and has been fully "out of the house" for over a decade. The parent not only raised up the child, but was right there when the GDS (then known as CRS) paid its first signing and retention bonuses and "productivity credit" payments to travel agencies in the early 1980s. At the time my business card read "American Airlines Sabre", and I know this to be a fact. As my book ECommerce Pioneers aptly documents, American Airlines Sabre was not alone in this practice. The then "United Airlines Apollo" (now part of Travelport) was in a head to head battle for market share on the travel agency desktop and these payments were a major part of the competitive arsenal of their respective marketing automation divisions. Contrary to what the airlines would have the DOJ believe, this is NOT a new practice. I can hear the parental dialogue echoing, albeit silently and perhaps under the breath of the airline executives...... "well I didn't mean for you to keep doing what I encouraged you to do when you lived under my roof...". 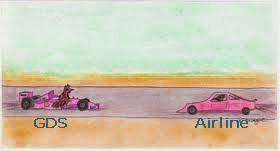 For those not familiar with this particular aspect of Sabre's history, AMR, the parent company of American Airlines spun off 17% of the company in 1996 for approximately $545 million and in 2000, Sabre Holdings went public and AMR monetized the balance of its investment. In AMR's 2000 Annual Report, Don Carty stated to the shareholders "But 2000 was a unique year for our Company, as March brought the spin-off of our 83 percent stake in Sabre Holdings Corp. (Sabre). That transaction gave individual shareholders the equivalent of a one-time $34.96 per share dividend, which means that on the day the transaction took place, AMR shareholders benefited from a $5.2 billion transfer of market value". Leap forward a decade. Sabre is now privately held by TPG and Silverlake and as such, their performance is not a matter of public record. We know they are still a major force in the automation of over 55,000 travel agency locations, both here in the US and globally, connecting them to over 400 airlines, 88,000 hotel properties, 13 cruise lines and 30,000 car rental locations. And while there has been much talk of the inefficiency of the legacy platforms that the GDS are built upon, Sabre processes about 19,000 transactions per second, about 2 billion every day. Transfer of market value to American Airlines shareholders is now a distant memory. American Airlines is not happy about the fees paid to Sabre (or any other GDS for that matter) and is especially unhappy that those revenues are shared with travel agencies. It seems that they have conveniently forgotten their role in forging this practice. In early January of this year, following a scuffle between American and Orbitz, and Expedia subsequently pulling AA's flights in December, Sabre announced that it would be pulling AA's flights from Sabre in August of this year. They then modified their display algorithms, disadvantaging American. While fair GDS display algorithms are no longer dictated by the Department of Transportation CRS rules which were repealed nearly a decade ago, to date all of the GDSs had continued to follow the basic standard spelled out by those rules. This entails showing non-stops first, then direct flights, then connections. Online travel agencies (OTAs) and corporate travel self-booking platforms were not held to this same standard. On January 10, 2011 in a district court in Fort Worth, American and Sabre agreed to a truce in their battle over how American's flights were shown in Sabre. Litigation between the two companies was put on hold until June 1. That truce ends this coming week and both parties are "revving their engines" in what appears to be a very serious game of chicken. Agencies and corporations alike are being told by AA on their Direct Connect distribution blog site that they will need to connect to the AA system via various systems listed in the Technology Pavilion. There seems to be a very strong "wait and see" attitude on the part of agencies and corporations. There are many ways to solve this problem, but a reckless game of chicken is not one of them. If the GDS companies flinch, the result is that they give in on the pricing demands of the airlines (or at least significantly bend in that direction). No one can speculate how deep a discount is being requested by AA, but suffice it to say that it is way deeper than the GDS is willing to go. Price is not the only issue. The merchandising of the various "extras" that AA has added to its online platform are also part of the negotiation. Sabre is arguing for complete transparency of these fees to the consumer, which is not possible as long as they aren't able to support the sale of these products. AA currently supports the sale of these products to travel agents and corporate travel managers through the Farelogix SPRK platform, but not through the GDS. If the airline flinches, they might settle for a different business model from the GDS, but definitely not the status quo. One option could be a higher payment for high value transactions and a lower payment for lower value transactions. Or a different payment for agency transactions (offline) and another for OTA transactions. If they crash, AA either goes "dark" in Sabre (they do not renew their participation agreement) or they go back to "grey" (display algorithms push them back many pages in the availability results) and AA likely goes back to court for a more permanent injunction, pending the DOJ investigation into GDS Antitrust. Meanwhile, depending on the depth of their dependence on AA, agencies and corporations will then have to scramble to implement a direct connect to AA and somehow sort out the impact on their front office, mid office and back office platform infrastructure. In any one of the three cases, the agencies and the corporations deal with what is left in the wake, either bearing the cost of the concessions on either of outcomes one or two or from the incremental cost and productivity hits of outcome three, where agencies will be required to access a third party system to access AA's flights and fares. Most of the 14,000+ agencies in the US do not have IT departments that are capable of any level of systems integration, whether directly to Farelogix SPRK or to navigate the 8 pages of options given on the Technology Pavillion document posted on the AA direct connect site. And even the most tech savvy agency owner or manager will have a full time job on their hands just discerning what part of the puzzle each of the 18 companies on the list solve, as they definitely are not apples to apples. 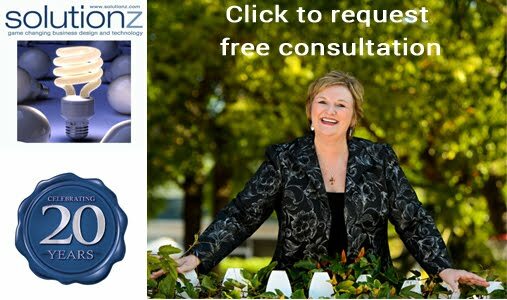 Solutionz is devoting significant time to navigating these options for our agency and corporate consulting clients. And lest we forget both the corporate and the leisure consumer, it is likely that in the end, the costs of this argument will be passed on to them, if nothing else in the form of their taxes to cover the ongoing DOJ investigations. Stay tuned. June 1 is right around the corner. Any first year MBA student already knows that in order to see the profit picture clearly, you need to look at both revenue and cost. The sunglass graphic at the right is one that I created to make this very basic point. Most of you have played the game of covering up one eye and seeing how distorted your perspective can be as a result. In fact, if you have ever had to wear an eye patch for any reason, you will know that it is extremely dangerous to drive under that circumstance. 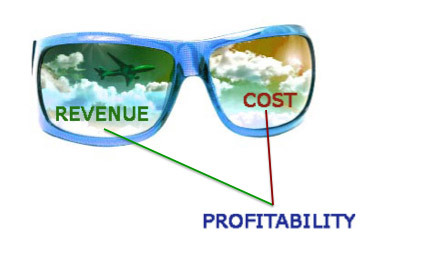 If revenue and cost were the two lenses of glasses and you cover up either one, you will not be able to clearly see your profitability picture, which is equally dangerous, particularly when you are trying to navigate which channels to use to sell your products or services. If you have been following the dialogue (some would say diatribe) between the airlines and the Global Distribution System companies (GDS), you will know that quite often, in their own defense, the airlines will cover up the revenue lens and talk about how the costs of the GDS channel are exorbitant. This reduces the value of the GDS to that of a pipe, which is a gross oversimplification of the role of players like Amadeus, Travelport's Apollo, Galileo and Worldspan and Sabre. And now with the Department of Justice in the fray and my tax dollars being used to resolve the argument, I feel compelled to speak up. For those that have followed my musings on distribution, you will know that I have been equally critical of decisions made on both sides of this equation. I will do my best to present a dispassionate view of this business fundamental. If you cover the cost lens and look solely at REVENUE, when you open both eyes you may find that the cost to produce that revenue through "Channel A" is exorbitant, resulting in a loss per transaction versus profit. Likewise, if you cover the revenue lens and only look at the COST side of the equation, you will not see the clear profitability picture necessary to make the decision about what channel to use to sell your profits and services. 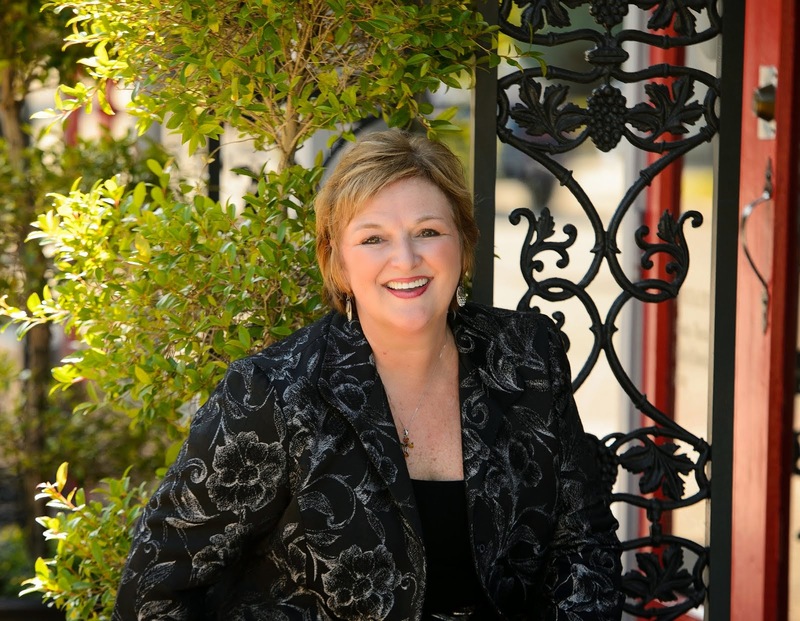 As an example, if the travel agency channel is a completely variable cost channel (i.e. you only pay if you sell something) AND the average domestic ticket value is $407.73, then even with a 10% commission (which is more than most agencies receive) and a $13.20 booking fee (assuming 2.2 segments @ $6 per segment, which would also be high, but is based on Travelport's recent annual report), then the net to an airline is $353.76, which is nearly $50 higher than the direct revenues of $312.69. At the end of the day, this analysis must be done by every airline and every GDS, and even the agencies that are affected by this battle. When you sit down at the negotiating table (whether it is the GDS/Airline discussion, the Airline/Agency discussion, the Airline/Corporate Travel Manager discussion or the GDS/Agency table), know what you bring as value to the other player. Know your costs (direct and indirect), but also know your average revenue contribution (domestic and international ticket average value). I contend that this is not a technology issue, but one of business model and reinvention. It is time to recraft the models in our industry. Next week I will begin a series called Distribution Myths. The first issue that we'll tack is whether disintermediation is all about technology. Enjoy your long weekend. Rest up. It will be an interesting summer.